As young teenagers, they met for the first time at their local Church’s youth group. Being 2 years apart, the two didn’t spend much time together, but both knew of each other. Neil remembers his sister’s good friend Shellie having the most most beautiful smile, and awesome 90’s hair. Almost 20 years later and not having seen one another since a teen birthday party, Shellie and Neil reconnected through Facebook. They started sending Facebook message back and forth until Neil worked up enough courage to ask for her phone number. For five entire days, Shellie contimplated taking the next step with someone who she hadn’t seen for nearly 20 years –as Neil patiently waited. After almost a week, she decided to give Neil her number. She was leaving for LA on a business trip, and spent the entire trip texting back and forth non-stop as they got to know one another… again. Once home from business the texting continued, and Shellie nervously took the next step. On Neil’s birthday, he looked down at his ringing cell phone and saw the girl he had been non stop texting for weeks CALLING. He answered eagerly and described that ten minute conversation as “the best 10 minutes ever.” A first date was planned, and when Neil went to pick up the girl he hadn’t seen in 20 years, they hugged, and Shellie leaned in for a kiss. That memorable kiss, turned into a magical first date, and the love they share for one another turned into Neil asking the love of his life to marry him last November. The love and laughter between these two is wonderful! I LOVE this dress and color! Have you SEEN this ring? After a quick outfit change, we headed to a different favorite spot on the Lake (which coincidentally my husband spent his childhood summers at)! 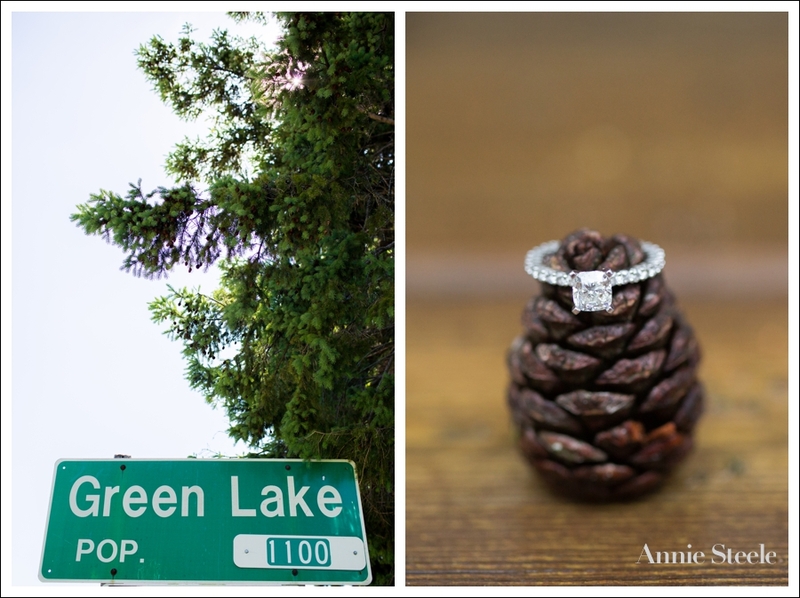 Love Shellie’s pop of color in the serene setting of Green Lake! Why not dip in one of the places you love together? If you’re going to dip… you should dance it out, too! (Have I mentioned I LOVE this couple)! I’m so excited for S + N’s future together! Rain or shine… it looks beautiful! Happy Tuesday, friends! Leave some love below for this couple who will vow their lives together ONE MONTH from TODAY! Shellie, first and foremost I wanted yo say I love you with all my heart. Happy bday my Sweet love. Only 1 month away from togetherness forever!!! Can wait for you to be “All Of Me”. I Also wanted to Thank Annie and Pete for making the trip. it was a long way to go just for an engagement shoot. I would recommend you both to anyone!!! !